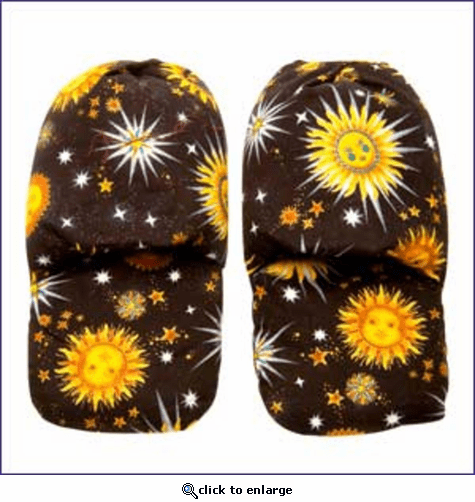 Heaven's Therapy™ Foot & Hand Warmers can be used for relief of tired feet or hands. Use hot or cold to relieve stress after a long day of work. The unique design of the Foot & Hand Warmers allows you to use them as mittens on your hands or as slippers on your feet. They are perfect shape to target pain caused from arthritis, carpal tunnel syndrome and other types of inflammation. Just heat these herbal packs in the microwave and place it on an aching muscles or joints for fast relief. You can freeze the pack and use it to reduce swelling, muscle spasms or bruising. The natural herbal fill will alway conform to the contours of your body for maximum relief. Great for people with cold feet and poor circulation. Relax while watching TV, at the office, and anywhere you need to feel relief. Aromatherapy Herbal Packs are filled with an all-natural blend of herbs that provide a calming, soothing effect. Use hot for a therapeutic treatment that will provide instant relaxation while relieving muscle soreness and stress. "Pot Luck" Fabric Patterns: Please note that Nature's Therapy\xBB Herbal Packs are shipped in a variety of patterns including celestial, solids, animals and more. In order to offer you the lowest cost possible, we can not guarantee which fabric will be shipped in your order. We hope you enjoy your purchase! Microwave for Hot: Arthritis, TMJ, Sports Injuries, Migraines, Headaches, Earaches, Backaches, Neck Pain, Muscle Pain, Menstrual Cramps, Bursitis, Tendonitis, Sinusitis, Flu, Stress, Colic, Restless Leg Syndrome, Insomnia. The heat from the pack opens the pores in your skin, allowing (transdermally) the healing herba to go through the pores, going around the muscle tissue, and nerve ends, creating a barrier to stop pain and relax muscles and the body. Most importantly, creating a healing effect. You will feel the pain and stress disappear and the magic work as you place the pack on your body. The cozy warmers are a frequent partner at the end of the day. Perfect for our sore muscles in the evening and bedtime. Make great gifts around the family as well.